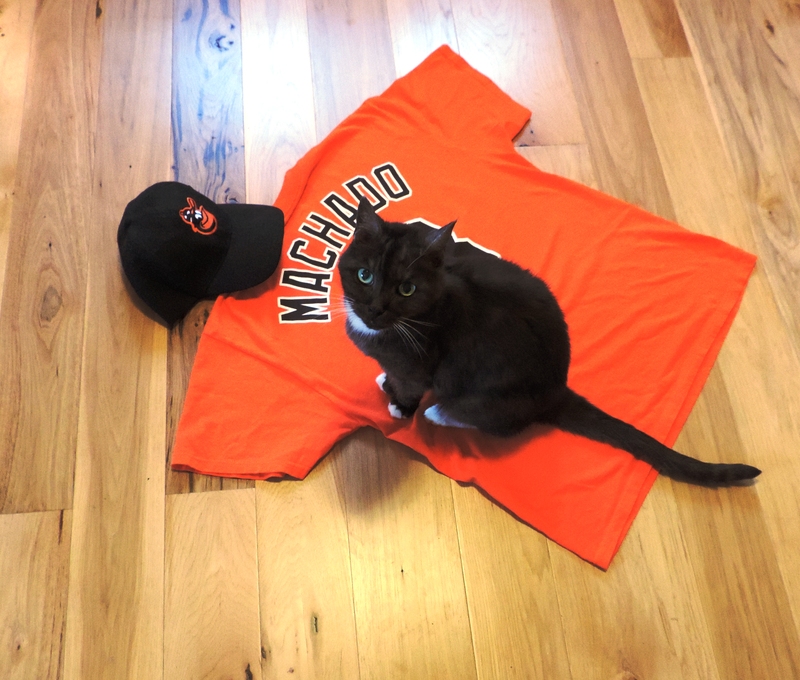 I guess my beloved Manny Machado tee-shirt had a little mojo left in it afterall. If your baseball season has to end before October – and for 19 teams the season ended Sunday – then the best you can do is hope to win your last game. 7-6 … Orioles over Red Sox. It’s always nice to beat the Boston Red Sox on the last day of the season. Sometimes that single win can change everything, like in 2011. This year, it didn’t mean as much, except that the Good Guys won and Jim Johnson got the save and notched his second consecutive 50-save season. 7-6 … Giants over Padres. Another exciting comeback … a walk-off win! 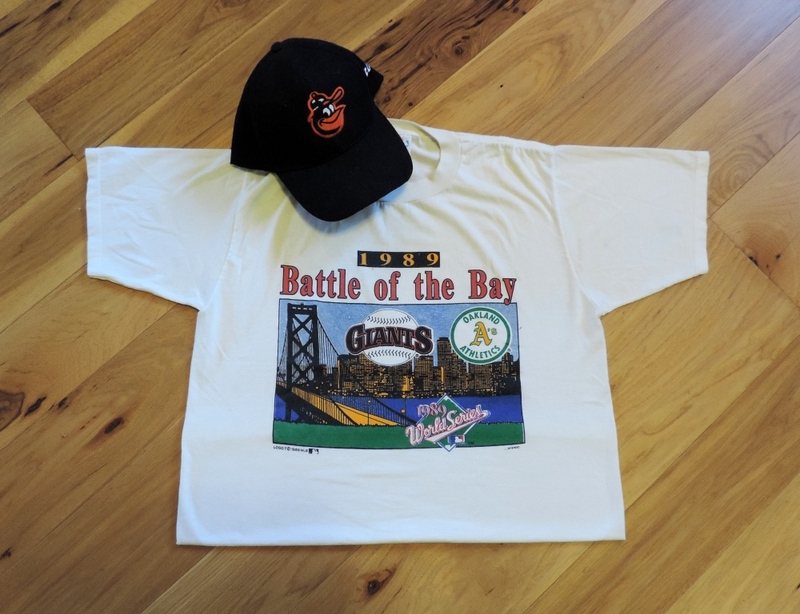 Apparently the Manny Machado tee-shirt is also soft on the Giants. But, now, I got nowhere to be until next season. Have you ever been invited to a party that you didn’t want to go to? You don’t really know the people, they seem a little strange … you’re not going to know anyone there … they live in a weird part of town … they’re not as much fun as your friends … and all you really want to do is stay home and watch TV? Because oh, I don’t know, maybe there will be snacks? I’ve been looking for a post-season team to follow. Just a temporary, meaningless fling. Someone to pass the time with for the next few weeks. I asked for suggestions. I have a lot of Red Sox friends. I thought they might put in a good word for their fuzzy-faced team. But, silence. But, just when I thought no one wanted this lonely Oriole fan’s support, I got a couple posts from Oakland A’s fans. OK, that’s possible. Just going from the O’s to the A’s is simple vowel-hopping. I’ve actually been to Oakland Coliseum, though many years ago (pre-sewage). 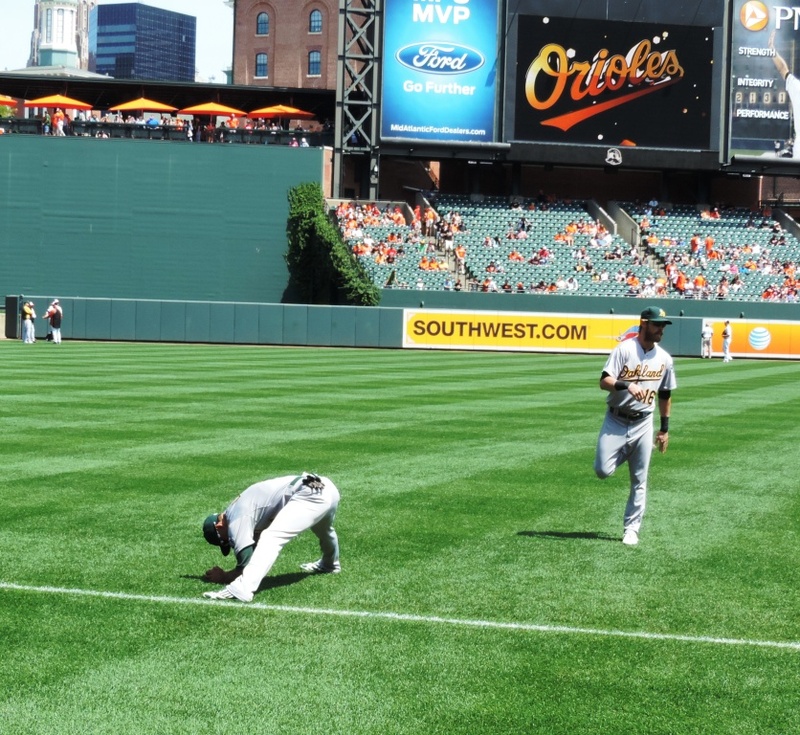 In August, I took photos of A’s outfielder Coco Crisp before a game at Camden Yards. A’s Outfielder Coco Crisp on the left. Just 183 days until Opening Day. This entry was posted in Baltimore Orioles, Baseball, Life and tagged Boston Red Sox, Jim Johnson, Manny Machado, Oakland A's, Post-Season, SF Giants by Jackie, The Baseball Bloggess. Bookmark the permalink. I can’t even begin to express how disappointed I am with you right now. I know … I felt bad about this. After all, you are one of my three readers, and that’s no small thing in my book. It ultimately came down to the tee-shirt. I had an old Cardinals spring training tee-shirt somewhere … but couldn’t find it. But, there was the A’s shirt all worn out from that earthquake series. And the Cardinal’s system raised Coco Crisp into the fine player he is today, but whatever. I think Coco has played for just about everyone — except the Mariners. I remember hoping they would snare him so I could root for him, just on the basis of his name. But no, he had to go to the As. Humph. I thought Coco was a journeyman, too. So, I looked it up and Indians, Red Sox, Royals, & A’s are his only stops in his 12 seasons. Nothing wrong with having a fallback position (or team) when the ultimate goal is unattainable. And what a season-ending game for the O’s! That’s going out in style! Horray! Nobody wants to see the Tigers go to the World Series again and choke, again. Coco is awesome and is never allowed to leave the team now. Ever. Last night’s game was pretty amazing. Sean Doolittle played at the University of Virginia, so he has a huge fan base out here pulling for him. I was just at the UVA intrasquad game yesterday — I can always find October baseball somewhere! Hope the A’s keep at it! I love Doolittle! He’s such a cool dude. One more win! !